We offer unique Stretch Wrapping Machine which are highly precise and completely automatic. 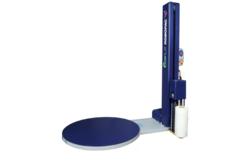 These stretch wrapping machines are high in demand by the packaging industry. The New Eco range includes 4 different models all available in transpallet version, the distinguishing mark is the revolutionary control panel that allows a very simple and intuitive use of all the many available wrapping functions. We are looking for customers from South India like Andhra Pradesh, Tamil Nadu, Kerela, Karnataka etc. Pallet Stretch Wrapping Machines dedicated to doors, windows and other finished and semi-finished products in this manufacturing industry equipped with idle rollers conveyor and manual product lock system. Durapak Carton Stretch Wrapping Machines are a simple and convenient device to wrap carton boxes and objects of similar geometry using stretch film delivered from Powered Pre-Stretch Unit. Stretch Wrapped Protection can be given to small medium sized objects packed in carton boxes, cans, tins, drums, etc. 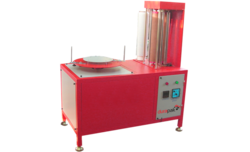 This is highly suitable for goods with light weight that can be manually loaded, turned over, wrapped and unloaded from the machine. This machine can be easily integrated into conveyor lines. Provides inexpensive method of protecting carton boxes and similar products from moisture and damage during transportation. Wraps using stretch cling film. Very high throughput – up to 120 packs per hour. Easy manipulation of load to provide bi-directional wrapping. Digital display of Stretch percentage, film consumption. Suitable for industries like Apparels, Garments, computer components, handicrafts and food products packed in Carton boxes. Optional – Pneumatic cylinder with top platen models. Industries manufacturing Goods like Computer monitors, Domestic pumps, Electrical Electronic Goods, Engineering items, Cosmetic items, Consumer goods etc., have to pack huge quantity of their valuable products kept in Carton Boxes daily. Our range of Stretch Wrapping Machines is suitable for packing the above consumer goods quickly while giving additional protection too. This simple to operate, table-top model machine consists of a motorized variable speed Turn Table, so that the operator can conveniently stand near the machine and stretch wrap the carton boxes / products quickly. The ‘powered pre-stretch’ unit stretches the LLDPE stretch cling film upto 300%, so as to cover the products consuming least quantity of stretch film. This results in very low packing cost. About 120 Boxes per hour can be easily stretch wrapped using this machine. This machine enables Industries manufacturing items as above to drastically reduce the hands in packing department; to give added attraction and protection to the printed carton boxes containing valuable products inside; to considerably save total power costs, when compared to shrink wrap system. This machine is suitable for products weighing upto 50 Kgs, requires only 220V, 1-phase, 15 Amps 0.75 kW power supply. The Compacta series machines are built following high quality criteria and construction specifications that have been improved and refined through time. 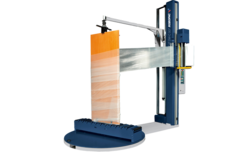 The high degree of satisfaction generated worldwide by the Compacta Automatic series makes these machines the top preference of final users, which entrust their products to horizontal wrapping technology using stretch film. Thanks to a wide range of ring diameters this line of machines manufactured by Robopac covers completely a broad range of wrapping needs. Compacta S is a machine that combines construction sturdiness with top-level automatic wrapping operations. The versatility of use and the user friendliness of Compacta S, combines with high quality level that distinguishes them and places also these Robopac products at the top of their categories. 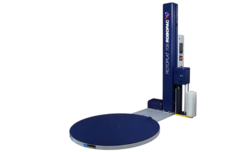 New generation Robopac series 8 Turntable Stretch Wrapping Machines are our most popular general purpose stretch wrappers which are designed to wrap the majority of all pallet loads. 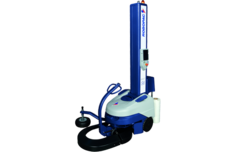 It's a perfect fit for the semi-automatic environment as it can be loaded with a pallet jack or fork truck. The new ROBOT S6, wrapping machines, positions Robopac as the best partner for all manufacturers who require maximum warehouse logistics and management. Robot S6 demonstrates its leadership due to the new technical innovation for simplifying its use. ROBOT S6 is designed and produced according to the policies that distinguish Robopac in terms of reliability and durability. Every single detail was designed selecting the best materials on the market. No detail was left behind and the hi-tech solutions and craftsmanship can be seen in each inch of the machine. 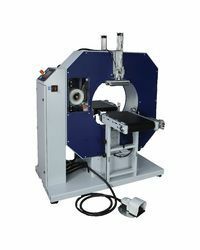 Looking for Stretch Wrapping Machines ?